Jug Orchid, Pterostylis recurva, Mount Observation, Western Australia. Canon EOS 550d, Sigma 105mm macro, I/125 sec at f8, ISO 1600 with fill flash. My shoulder has recovered well from the recent surgery and I’ve been able to get out and about round York. The other day I took a speculative drive out looking for dancing spider orchids when I found this solitary little jug orchid. Normally not seen up in the wandoo forest and when found they are usually in largish colonies. So it was a nice little find and compensated for not finding the others. Every other day I’m walking up on Mount Brown, which is in York, with the dog and it is now covered with a carpet of flowers that are a riot of pinks and yellows. Even the weeds are looking fantastic! Non-native yellow daisy Arctotheca calendulae. Mount Brown, York, Western Australia. Panasonic Lumix LX-5. Exposure – aperture priority 1/640 s at f/8.0, ISO 80, with -1 stop exposure compensation with fill flash with -1 stop flash exposure compensation. 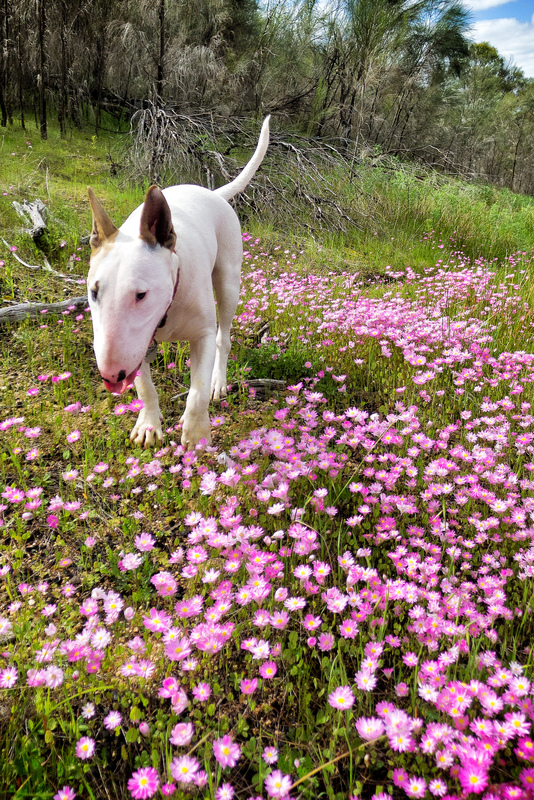 Of course me on my hands and knees crawling among the flowers created a lot of amusement for Frida, my bull terrier. It took ages to clean the dog slobber from off the front element of my lens. Frida running through a meddow of pink everlastings on Mount Brown in York, Western Australia. If you are interested in purchasing any of the photos click on the image and go through to my online gallery. < Blimey that was quick!